Pivot Points are being used more and more by Forex Traders and are an excellent tool for calculating entry and exit points as well as levels for Stops. Pivot Points are super-sized-support and resistance levels that are calculated from the price action from the previous day. The reason these levels are superior to Fibonacci levels is because there is no subjectivity involved in calculating them. For example, when choosing a range to mark Fibonacci levels one person may choose a range from the one hour and another person might choose a different range all together which would result in 2 different sets of support or resistances. These systems of finding support and resistance are very subjective and therefore are prone to human error and interpretation. Pivots, however, are based on the High, Low, and Close of yesterday’s price action and therefore there will be very little fluctuation in the results. Pivots are good at forecasting short-term price levels because they are reflective of both short-term volatility and trader psychology. I personally calculate my levels from midnight to midnight eastern standard time. Calculating pivots for the last session is measuring short-term volatility and direction. 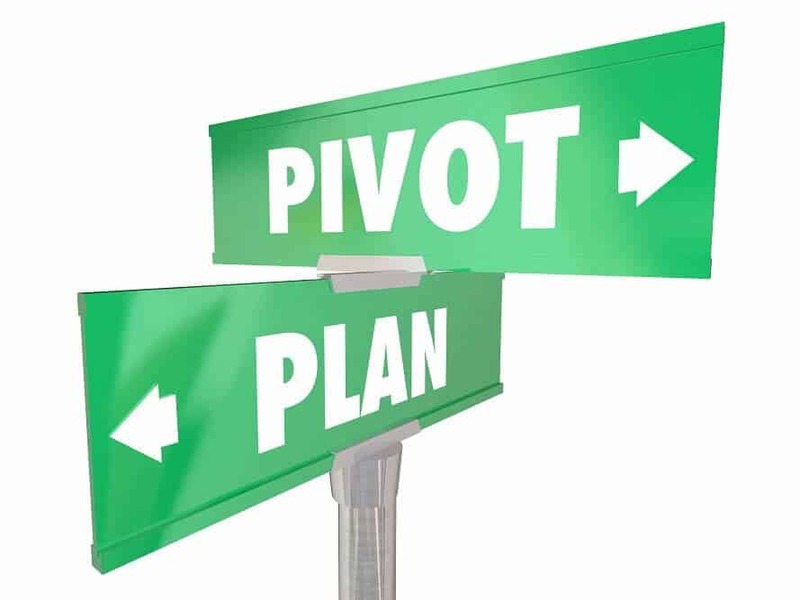 Pivots also reflect trader psychology in that major pivot points are also: major Fibonacci retracements, major levels of support or resistance, and sometimes Elliot Wave retracement levels. The support and resistance levels are then calculated using the pivot point. There are also mid pivots as well and rather than trying to calculate all these levels every day we use an indicator to automatically place these levels on our charts. While all three of these types of systems are quite subjective, there will be enough traders in the market using these methods to turn a pivot point into a ‘battle ground’ between buyers and sellers. Price action speeds up around pivot points and makes it a lower-risk entry or exit point. Remember, no system will forecast with 100% success. What we’re seeking to do is lower our entry and exit risk and raise our odds above random entry. By only entering around pivots we can minimize our risk greatly. 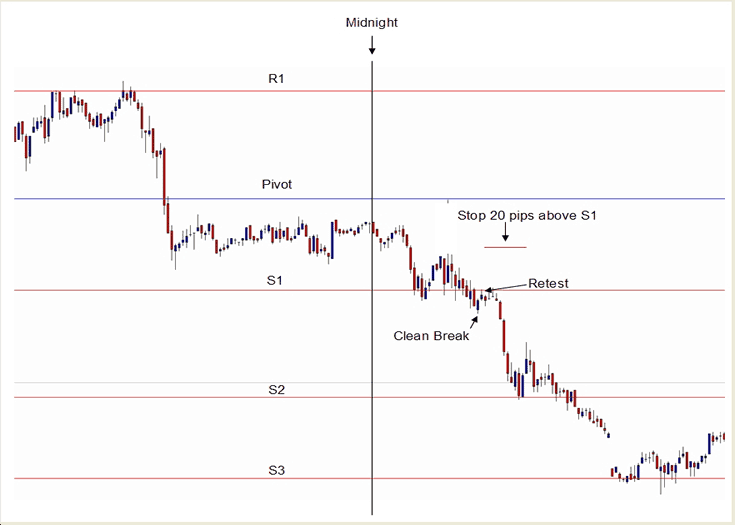 Pivots are made up of 1 pivot line, which is the center of the range, 3 levels of support, and 3 levels of resistance. The calculator included with this course will also calculate an additional 6 levels. These levels are called mid-pivots and are used for intermediate targets and possible entry levels. It is advised to implement these using a breakout strategy rather than a reversal point. These levels act just like a regular pivot however they can be slightly weaker. momentum of the market and current volume. If volume is low it is best to pass on the trade unless you have overwhelming indications of a trade. Providing you have proper volume and momentum you would go short when one of the support levels are breached and long when a resistance level is breached. Keep in mind that resistance becomes support and support becomes resistance once broken. You want to wait for a convincing breach to ensure that the market has indeed broke the level. Usually waiting for 1 or 2 (15 min) candles to open and close on the opposing side of the level ensures that the market has broken the level. Always enter as close to a pivot as possible. This will limit the risk you take on in each trade as stops should be approximately 20 pips above or below the broken level. Many times, the market will return to the level that was broken before continuing on; this provides an excellent entry with a very tight stop. You should not enter between two pivots if at all possible as this will increase your risk by increasing the necessary stop for the trade. Below is an excellent example of a break below the S1 level of our Pivot Point Indicator which is with the overall momentum of the market. This illustrates a clean break followed by a retest which gave an excellent short entry with minimal risk. The second strategy for trading pivots would be using these levels as reversal entries. When the market is moving towards a Pivot level your entry would be to buy off of support and sell from resistance. This strategy works best when the market is range bound. You must watch these trades very carefully because they are against the overall push. If a support level is breached and the market lingers below for to long you should look for an exit opportunity. As I stated earlier, the market tends to revisit the level which will give you the opportunity to exit the trade with little or no loss. If a level is good for a bounce it will generally reverse fairly quickly. Therefore, if you don’t see profit after 30 to 60 minutes you should be very cautious and once again begin looking for an exit. The example below illustrates a low volume day where that market is range bound. Under these conditions, you would sell the resistance and buy the support using close stops and target 50% of the distance between the levels. This is a good example of a range bound market. In addition to standard Pivot Points we also monitor Camarilla Pivots. The Camarilla Equation produces 8 levels from yesterday’s open, high, low and close. These levels are split into two groups, numbered 1 to 4; for simplicity, we only use 4 of the 8 levels. The 4 levels are L3, L4, H3, and H4. Traditionally traders would anticipate a reversal at either the H3 or L3 levels and would take a position against the immediate market direction and trade back to the market open.